innenberg Elektronik offers thousands of products and most of them come from the Far East. China, Taiwan, South Korea and Japan quickly conquered a market segment that seemed to be reserved for DIY products. DACs designed to work with computers as sources and matching headphone amplifiers seemed at first out of place on audio market. Why? Because they were cheap and no big brand imagined that they could prepare a decent product in a competitive price. Today most audio manufacturers offer such products, from Sony to Denon, from Furutech (sold under ADL brand) to OPPO. Later also audiophile companies decided to make use of this trend, and some of them were founded as a response to markets demand with Schiit Audio, or Linnenberg Elektronik being nice examples. And the latter were not particularly interested in selling their products at lowest possible price level. Or maybe they did want to offer reasonable priced products but to achieve that they tried to miniaturize their products instead of using cheep elements inside. They can't really lower the price using so called 'effect of a scale', as they don't sell quantities big enough, so they use smart saving such as clever enclosure designs and such. Inside though, one finds an advanced electronic circuits and high quality components. Linnenberg Elektronik was founded in 1994 and led by an engineer, Ivo Linnenberg. It is a representative of above mentioned generation of firms. 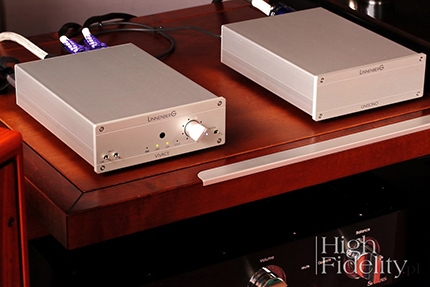 Back in a day focused on classic components, such as amplifiers and CD Players, today it offers only D/A Converter Vivace 2, headphone amplifier Maestro and two power supplies – smaller called Legato and bigger one, Unisono. Both DAC and headphone amp require external power supplies. 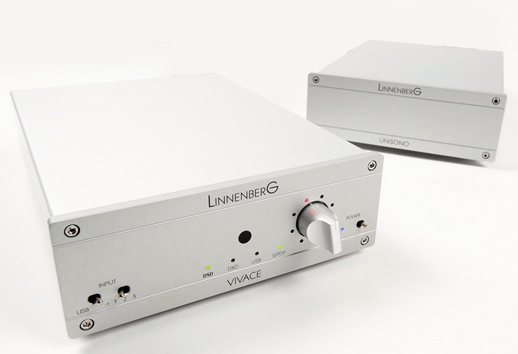 Vivace 2 is a very modern device – not just a DAC but also a preamplifier. It features four digital inputs, with USB being the prime one. This one accept PCM signal up to 384 kHz and DSD512 (Quad DSD). The others accept PCM up to 24/192. DAC features also volume control and it delivers a high output signal – up to 8 V for XLR and up to 4 V for RCA. It is powered with Legato or Unisono; for this test we received the latter. 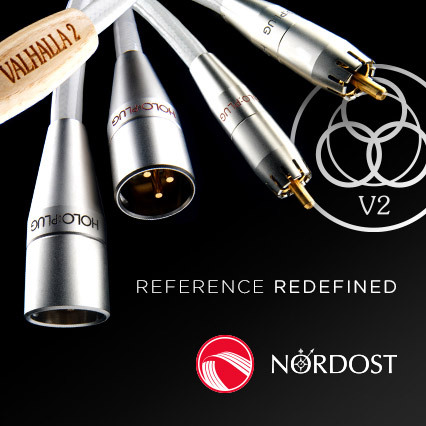 It feature an enclosure of the same dimensions as Vivace 2 and it connects to DAC with a multi-strand umbilical. All devices look solid, nice and are user-friendly. Volume level might be controlled using an Apple remote; it is not delivered with DAC – one has to buy it oneself, it costs around 30 EUR. WOJCIECH PACUŁA: How does your DAC differ from other ones? IVO LINNENBERG: I think there are many differences to competitive products. First, we employ only the highest quality parts, usually certified for medical and demanding industrial applications. The ubiquitous voltage regulators for instance: ours (sourced from leading manufacturer Linear Technology) cost around 4 – 6 Euros compared to 30 cents parts usually employed. All resistors are 0,1% and 1% Beyschlag metal film, capacitors are sourced from WIMA to name but a few. The circuit design itself benefits from more than 20 years experience in digital audio. Every section of the DAC (power supply, USB transceiver, S/PDIF receiver, DAC stage, clocks, volume control, etc.) is designed with meticulous care. Take for instance the USB input. We use the same Amanero software, as many others (Gryphon, Yulong, Clones Audio, …) do, but we make our own hardware. This gives us the possibility to make it real special in employing a double slave structure. Take for instance the volume control. Nearly all of the competitors use the on chip volume control of the ES9018S DAC chip. We use a combination of analog attenuators for coarse control and the digital volume control for fine adjustment. The digital attenuation never joins in for more than 6dB. Such a low attenuation shows completely no losses – in real world, not just mathematical. What was your goal when designing Vivace 2? Tell you the truth? It was always my intention to build something that suited my own requirements and needs. I can’t stand having mediocre gear in my living room. Nevertheless, it is a commercial product. As such, my goal was to offer a prospective customer a product with an superior quality for a reasonable price. I always try to fit in as much technology as it is financially feasible. Sometimes I leave the region of ample margins. As I am not financially driven, I am free to do so. I am happy when a customer is happy – not when my bank account looks nice. How does Unisono improve Vivace 2's performance? Generally, the UNISONO improves bass performance and image stability. Nonetheless, the difference between the standard LEGATO and UNISONO is relatively small as long as your mains is stable and clean. The integrated mains filter in the UNISONO compensates for almost everything. Tell me a few words about you and your company. It is the old story of a young boy building his own equipment due to the fact that there is little money but high quality demands. In my case, besides amplifier and speaker it was FM Stereo Tuner that filled my leisure time. Why FM Tuner? Because sound was not bad at all (compressing was unknown) and buying the latest records was out of reach these days. We are talking about 1980 or something. After finishing university studies in electrical engineering, I founded my first company in 1994. Besides jobs for the mechanical engineering industry, I always offered audio gear. That’s what I do until today; and I am still having fun with it. Continue the work. At the moment I am working on a pair of mono amps because so many of our old customers asked for something new. While reading reviews of many different D/A Converters and music servers (mostly those in English) I often stumble across tests conducted with, in my opinion, strange assumption in mind. Namely people behind these test assume that 16/44 files (so red book CD standard) are somehow inferior to hi-res ones and only the latter allow the device under review to spread its wings. I hope that everyone who thinks alike will forgive me, but I'd like to point out how absurd such thinking is! If particular device can't perform well with CD quality files, or it delivers a different (inferior) performance compared to that with hi-res it means that there is something wrong with it. If it starts to deliver decent performance only when playing hi-res files, forget about it. Because what does it mean that “plays” only with 24/96 files? Only that it needs much more (bits of) information to deliver decent performance. In my opinion a high quality device must deliver good performance also with a 16/44 signal. Just as Vivace 2 powered with Maestro, does. I begin each of my DAC reviews with connecting a digital output of my Ancient Audio Lektor AIR V-edition CD Player featuring Philips CD Pro2LF transport mechanism, to this DAC's input. In this particular case I also used Vitus Audio SCD-025's digital output as a source (it features the same CD transport but modified and applied in a different way). 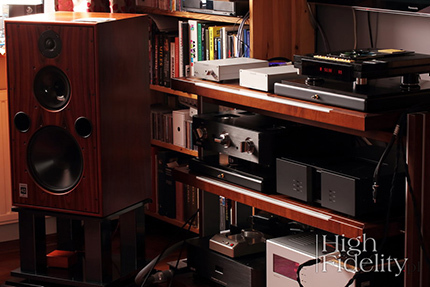 Mr Linnenberg's DAC receiving such signal offers a sensual, 'delicate' sound. Such a sound character is quite rare among DACs meant to work with computer as a source. Usually it tends to be very selective, with high dynamics and very rich, 'heavy'. In this way even small, active speakers fed with such signal might sound like a larger, floorstanding ones. Vivace 2 was designed, I mean I think it was, to be a part of a classic stereo setup for a real music lover or an audiophile, although rather for the former than latter (I will elaborate on that in a moment). Namely there is nothing 'catchy' about this sound, nothing falsely impressive. This performance seems rather soft, natural, one might even say - organic. There is not too much energy in the upper treble and lower bass areas. I might risk saying that the key element of this presentation is midrange, but it's not entirely true as it's not about as 'midrange focused' sound as the one of Vitus Audio, or Chartwell LS3/5 loudspeakers (you can find this review in the same „High Fidelity” issue).